Immediately, what stands out against these last 12 games is that 5 of the 12 games are against teams that Colorado is directly competing against for the final 2 playoff spots. Two games against Calgary, one against the Ducks (Colorado won this game 3-2 in overtime), one against Phoenix, and one against San José. Whether or not the Avs make the playoffs will. most likely be determined by those “4 point games”. The games will be between desperate clubs looking for as many points as possible, so they will be hard fought. Another aspect working against Colorado when looking at these games are the 3 games against the Vancouver Canucks and New York Rangers, not to mention the New Jersey Devils and Nashville Predators. Vancouver, to put it nicely, has owned Colorado in recent memory. They are 4-0 against the Avs this season, outscoring them 15-3 (including two shut outs). If this team wants to make the playoffs, ridding themselves of the proverbial monkey on their back is a good start. Considering Vancouver would be a likely first round opponent for Colorado, building confidence by taking a game or two couldn’t hurt, either. Nashville represents a similar problem to the Avalanche. The Predators also have won the first three meetings this season. Making matters worse, the trade deadline made the Preds one of the favorites out west, acquiring Hal Gill, Andre Kostitsyn, and Paul Gaustad. Since this is the last game of the year, Nashville also may have recently controversial Alex Radulov returning to the club from the KHL. All this being said, the Avalanche still have a bit going for them as well. Colorado has a very impressive 12-4 record against the Eastern Conference, which bodes well for their games against the Rangers and Devils (The Avs defeated Buffalo yesterday 5-4). Recent smoldering hot goaltending by Semyon Varlamov, and the success of acquisitions Steve Downie and Jamie McGinn also give Colorado hope, as the team has gone 6-3-0 since the trade deadline, including a current 3 game winning streak. 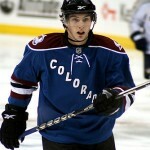 Matt Duchene and the Avs will need to play their best hockey of the season in the final 12 games. So far, as previously mentioned, Colorado has gotten off to a great start in this gauntlet. They opened up the remaining 12 with 2 overtime victories over Anaheim and Buffalo. Gabriel Landeskog, almost a guaranteed Calder trophy candidate, took home a game winner against the Ducks, while Peter Mueller scored the clinching shoot out goal over Buffalo. Which leads to one more important factor the Avs have in their favor over this stretch. The games are almost all guaranteed close, which could lead to several more overtime games before the season is through. Colorado is an NHL best 9-1 in shootouts based on winning percentage (New Jersey has one more win at 10-3), and 15-3 overall in the extra period. These extra points could go a long way in determining whether the Avs are playing hockey or golf come April.